... Also, look deeper into the detail of the FEET OF IRON AND CLAY (further below) and you will see even more, how amazing and accurate this prophecy was. BABYLON - We know the first kingdom of this image is Babylon, because Daniel told Nebuchadnezzar that he (king of Babylon) was the head of gold ... Daniel 2:38-40 ...'And wheresoever the children of men dwell, the beasts of the field and the fowls of the heaven hath he given into thine hand, and hath made thee ruler over them all. Thou art this head of gold.' ... 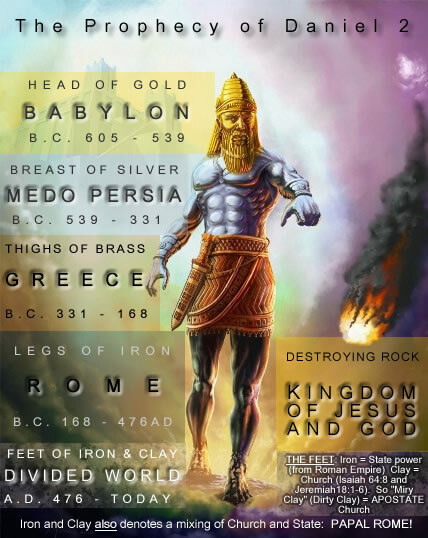 So we know that Babylon is the head of gold and Nebuchadnezzar ruled as king in Babylon from 605 BC. MEDO PERSIA - So the next kingdom which God allowed to conquer Babylon is represented by the chest and arms of silver. And history tells us that the kingdom which conquered Babylon in 539 BC was the Medo Persian empire. As the name suggests, this kingdom had two parts. The Medes and the Persians, with Persia being the stronger nation. This matches the fact that it is represented by the part of the body of the image that has TWO arms. Just as SILVER is 'inferior' to GOLD, Medo Persia did not have the glory which was upon Babylon. Also, it is known that taxes were paid in SILVER in Medo Persia. GREECE - The next nation after Medo Persia which conquered and took control was the kingdom of Alexander the Great - GREECE. The kingdom of Greece began to reign in 331 BC after the conquest of Alexander the Great in the battle of Arbela in 331 BC. ROME - Rome was the kingdom which ruled the world after it conquered Greece in 168 BC. And it was the dominant kingdom that ruled during the time of Jesus Christ. 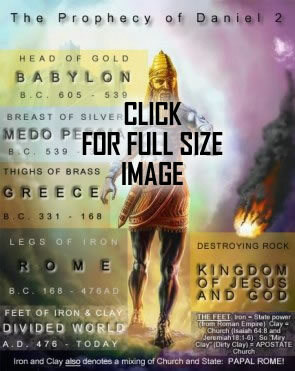 Now something to notice with these metals in the image is that they begin with GOLD, the most glorious metal, matching the kingdom of Babylon. Then as we progress down the image, the metals become less 'glorious', but STRONGER. And we end up with the 'IRON' kingdom of Rome. Probably the least 'glorious' kingdom, but certainly the strongest, as Rome was known for it's so called 'iron grip' during it's reign. EUROPE - The Roman Empire as a one world power disintegrated due to the attacks from the barbarian tribes. By 476 AD Rome had lost it's power and the tribes that sacked the Roman Empire became the 10 nations of Europe. These tribes were the Ostrogoths, Visigoths, Franks, Vandals, Alemannians, Sueves, Anglo-Saxons, Heruli, Lombards, and Burgundians. Three of these tribes were uprooted by Papal Rome (THE LITTLE HORN POWER) and the other seven evolved into the nations of Europe today, like Great Britain, France, Germany, Spain, etc. What is the Biblical meaning of iron and clay? If you read Psalm 2:9 and Revelation 2:27, you will see that iron is a symbol of a ruling power. So in terms of the world, iron would denote a civil ruling world power. And what about the clay? If you read Isaiah 64:8 and Jeremiah 18:1-6, you will see that clay in the Bible represents the people of God, with the Lord Himself being the 'Potter'. So IRON = Civil ruling power and CLAY = God's professed church. So God is telling us through this image that there would be a mingling of church and civil power AFTER the fall of the Roman Empire. And here is the important fact regarding the 'clay' (professed church). IT IS 'MIRY' CLAY (Dirty clay). Which means this professed church that 'mingles' with the civil powers is an APOSTATE CHURCH. And does history confirm any such thing happening AFTER the fall of the Roman Empire? Yes! The PAPAL CHURCH of Rome took control after Pagan Rome fell and the Bishop(s) of Rome took the place of the Caesars. And from their 'seat of authority' which Satan gave to them, they persecuted and killed millions of God's people throughout her 1260 year reign of terror. The FEET represents the union of Church and State - THE PAPACY! But what about there being TWO feet. If you read Revelation 13, you will see that AMERICA makes an IMAGE OF THE PAPACY. A church-state union in America - In other words, A COPY! What about the toes on the feet? Do the ten toes represent anything? Yes. Take a look at the following Bible verse ... Revelation 17:12-13 ...'And the ten horns which thou sawest are ten kings, which have received no kingdom as yet; but receive power as kings one hour with the beast. These have one mind, and shall give their power and strength unto the beast.' ... The ten toes represent the 'ten kingdoms' in the last days which unite with the Papal beast and give their power to the beast so that she can enforce her mark upon the world. KINGDOM OF JESUS AND GOD - We reach an end of this prophecy and the end of this world as we know it, when Jesus Christ returns at the second coming and destroys once and for all the kingdoms of this world. Then, after the 1000 year millennium and the earth renewed, God will establish His kingdom on the new earth, which will be an everlasting kingdom. A kingdom of glory and righteousness, where there will be no more wicked men to rule over us, but a just and righteous God.